What’s in a name? It depends on the name. But say “Jeep” and it will spark a plethora of reactions. Nearly everyone recognizes the name Jeep. Some smile as a distant, fond memory comes to mind. Others regale you with tales of weekend adventures. Many are passionate about the brand and swear they are dedicated, life-long owners. It’s such a short, simple name, yet the mere utterance of it evokes so many strong and varied reactions. With all the thought and marketing strategy put into branding these days, I had to wonder how they came up with the Jeep name back in 1941. (And jeepers, if only they had known what kind of cultural phenomena they were embarking upon!) Having read several articles on the topic, it seems there may be no definitive answer. One of the most popular theories is a direct result of the vehicle’s go-anywhere, do-anything design. 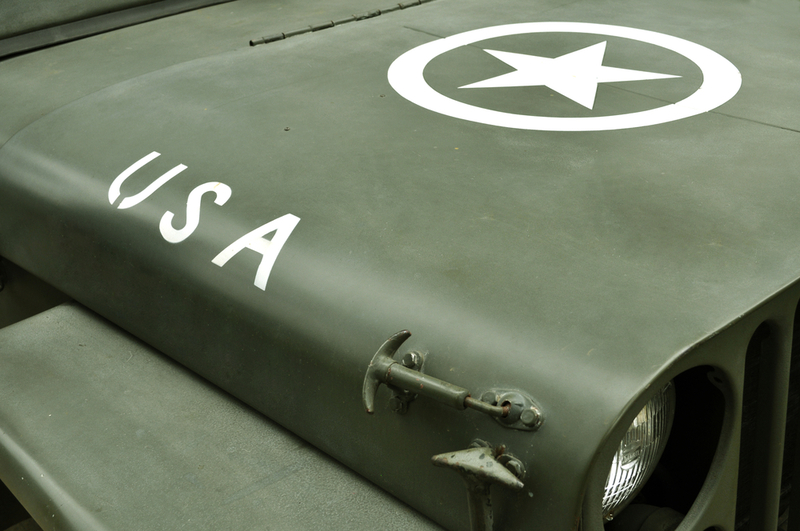 Because it could be used as anything from a frontline ambulance to a snowplow to a reconnaissance vehicle, it would easily have been designated a general-purpose vehicle, or GP. Slur the letters together enough times and soon you have geep – which evolves into jeep. However, there is no official military record of this. Add to that the letters GP were actually a Ford production code – the G indicated it was slated for government use and the P referenced the 80-inch wheelbase. These facts make the GP explanation seems a bit less likely. 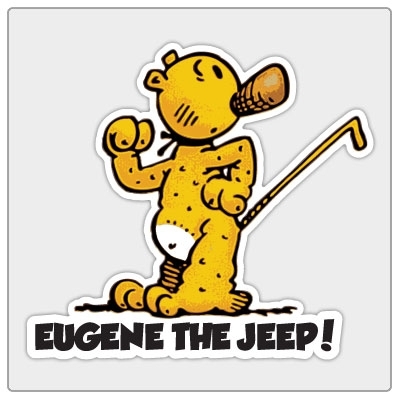 If you’re familiar with the old-time Popeye comic strip, you may also know Eugene the Jeep. Likening the agility of the character to that of the vehicle, it’s not a stretch to see why this is another popular (if not somewhat playful) notion of how Jeep got its name. LAWMAKERS TAKE A RIDE – With Senator Meade of New York at the wheel and Representative Thomas of New Jersey sitting beside him, one of the Army’s new scout cars, known as “jeeps” or “quads” climbs up the Capitol steps in a demonstration yesterday. Soldiers in the rear seat for gunners were unperturbed. And thus was born the Jeep to members of the American public.